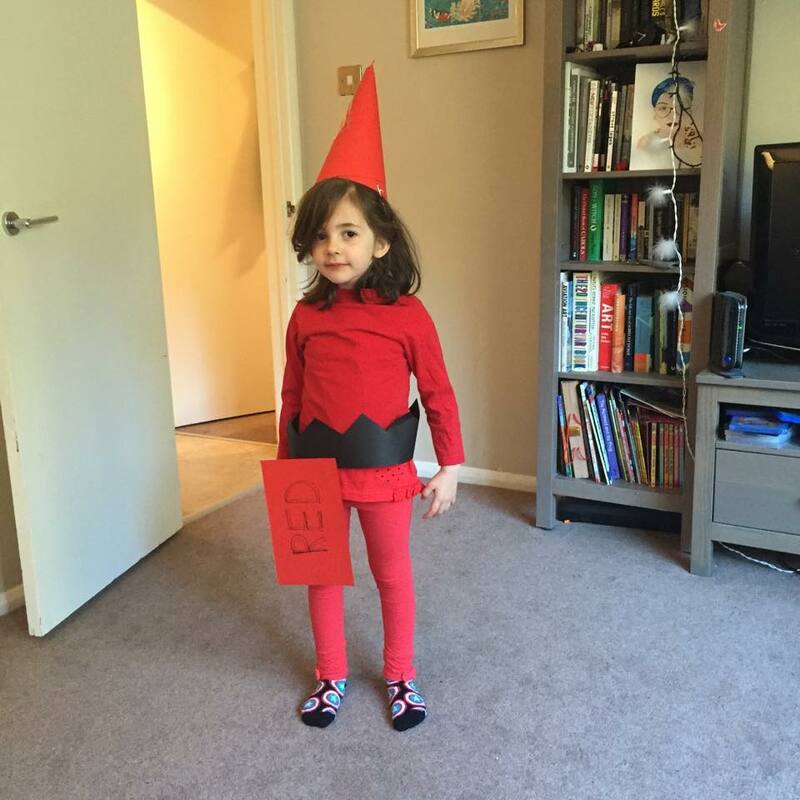 This year was our first year with a child at ‘big’ school, so it was our first real experience of the competitive costume gala known as World Book Day. Luckily, both our daughter’s school and the parents in it are pretty sensible; the school gave a week’s notice via a letter in which the head laid out in no uncertain terms that the buying or making of expensive and complicated costumes was really unnecessary – this was to be very much a home-made, celebratory, non-competitive and above all book-focussed World Book Day (they’re rebuilding the school library at the moment, too). Plus the other mums and dads at the school gates this morning were really great at making encouraging noises in the direction of all the kids. Yay, community! Anyway, as usual, because we are rubbish and busy loving and devoted parents, Ash and I left it to just a couple of days before to agree with R what she wanted to be on the day; we steered her away from the standard Disney kit, because we wanted her to think outside the obvious a bit. It’s no secret from the whole of the internet that I love Disney and Marvel (yes, that IS me in the Daily Mail wearing silly leggings) with an almost embarrassing intensity, but I was determined that this year at least we wouldn’t go the ready-made route. No judgement of those who did, do or want to you understand. I sewed the ‘belt’ trim to the t-shirt because it’s a really old, short t-shirt and I don’t care if it gets holes in it. I actually thought about stapling it on, but I wanted her to easily be able to rip it off if it annoyed her during the day – she still needs to focus on what she’s doing at school after all. Ash made the hat, which was a basic semi-circle shaped into a cone held together with tape and staples; as I said, we did splash out on some elastic to keep it on (and of course cut it slightly the wrong length so it falls off every time she looks down, but let’s face it – that was never going to stay on in school anyway). 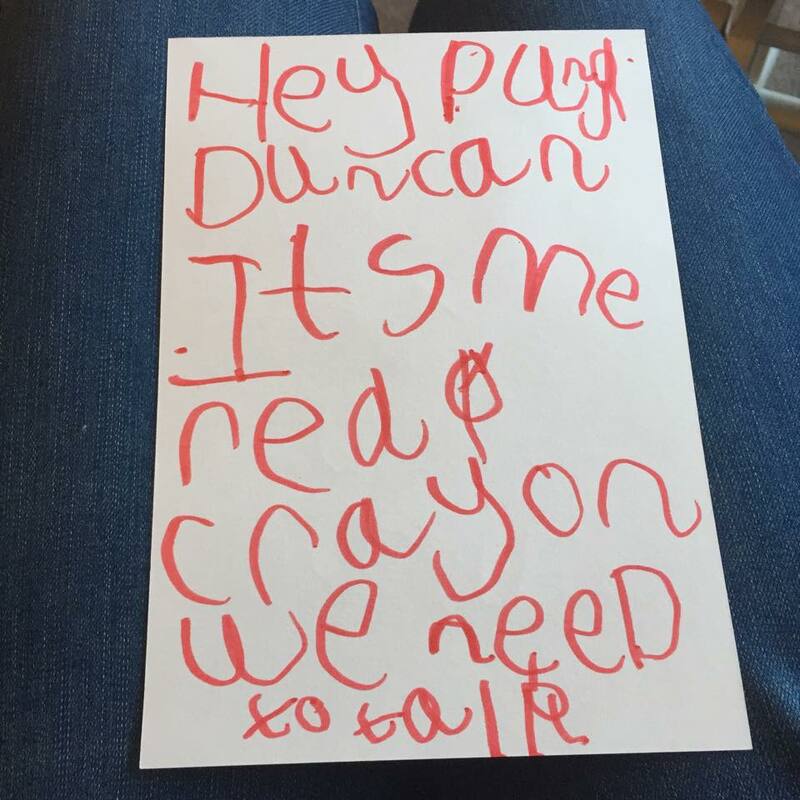 The letter to Dung Duncan was actually R’s own idea, and she copied it out herself which, given she’s only 4, I was very proud of; she wanted to do a copy for every person in her class, which is a genius thought but not when you have it at 8:00pm the night before and your bedtime is 7:30pm max. I think the cutest part was when she addressed it to her teacher but then decided to give it to her friend instead and crossed out the name on the back. Second hand letters are the most thoughtful, aren’t they? So there you go. Less than £5 spent, and we needn’t even have done that if we’d been prepared to cobble together smaller pieces a bit more (or had a better stocked craft pile. Or thought of making a paper chin strap for the hat. Or, or, or…). And now looking forward to spending the book token with R. Perhaps she’ll go for The Day the Crayons Came Home! Once there was a… failure? So, I got nine days into my 30 day challenge and it all went a bit wrong. There are reasons. A full-time job that has required some extra cover. A week where I barely saw my daughter after which I felt it not just right but as necessary as breathing to spend more time with her wherever possible. A few late nights in a row…. I guess reasons start to sound like excuses in the end. And I can’t deny I’m disappointed with myself. Still, I think even in nine days – and there is nothing stopping me simply restarting for a week or so, and I might still, since the desire is there – I learned the crucial lessons I was trying to hard to break into my thick skull that knew them but also didn’t. I learned that writing every day, and coming up with ideas from nowhere (when I’m so used to incubating them endlessly until they’re almost overbaked by the time they spill out) is possible – you can, if you want, force some creativity and it might be great, okay or utterly rubbish but it shall come. I learned that sharing a piece of writing in a raw, doughy, shapeless mass need not be terrifying. Most of the time, in fact, no-one will read it and there is an almost inexpressible freedom in that. When you suspect only four people are actually paying attention, it’s astonishingly liberating. I’m sure there is lots of common sense in writers seeking to be published professionally to think of audiences and tone, yadda yadda, but when you write just for the sake of removing the flaking orange rust from the dark cogs of your mind it’s so much more satisfying to please no audience except yourself. The skill of editing is a lesson for another day. Today we have just the words. I might have achieved only a third of my original stated goal, but I broke a frightened thought pattern in my own head, and that was, after all, the point of proceeding. And an idea for something to actually do with all these fragments has also occurred to me… if I can keep that thought pattern broken for long enough to attempt to achieve it. But first, I think, a little more writing. Maybe today (does this count? ), maybe not. But soon. And more often. And happier. Once there was a girl who had blue plaits and black eyes, with a tiny dot of gold twinkling in them. She used those eyes to Watch. She Watched while the child slept, covers hanging off, one leg at an unlikely angle. She Watched while the child played, making a carefully constructed mess. She Watched while the child sang to herself in her bed when she knew it was too early for anyone to come for her. The girl liked to imagine the child’s songs were meant for her, rolling somewhere around a tune and never squarely landing on it. The girl could not remember when she had started Watching, and she didn’t know what she was Watching for, but she knew this was what she was meant to do. She could just about remember the child as a baby, and was vaguely aware that her charge was getting bigger, but the passing of time was of no real interest to her. When the child was not in her room, the girl simply waited; not impatiently, because there was no schedule. When the child came back, the girl silently Watched. At all times she wore a smile that was a slim, tight line in her face. The girl was also vaguely aware that she must be wearing something; she had noted the child’s clothes, and how she got into special ones at night, which was quietly fascinating. But she’d never been too interested in looking at her own clothes; had she paid any attention she’d have seen a red and white striped top and yellow trousers. There were heavy blue boots that matched the colour of her thick plaits. But these were not the things she Watched. Gradually, the girl did notice one change. It was getting harder to Watch, because the view was getting less clear. She found the girl was getting… fuzzier. Greyer. Sometimes the details of her clothes were hard to make out. Watching sleep became nearly impossible now the night-light was no longer used; the grey and the dark merged into one as if the blanket was now over the girl and not the child. Who had also moved to the other side of the room, and a bigger bed. In the morning she no longer sang and her limbs didn’t hang out of the bed like a flopping starfish. She was, the girl was fairly sure, cocooned in a roll and she didn’t bounce out of bed with as quite as much energy, though she cried much less and she dressed herself much faster. The girl Watched as the mother came into the room with the girl one morning and started brushing something onto the walls. Patches of colour, she thought, in shades of pale purple, light green and creamy yellow. They seemed to argue a little over what they preferred, though eventually the mint shade seemed to win out. They started creating a pile of things in the corner of the room; a huge white sheet, a few fat tins – it was hard to make out the details through the dimness that wasn’t getting any better – and some blades that still managed to cast a glint of light into the girl’s black eyes. When the sheet was laid down, the girl was Watching. When the blades were taken up, and began scraping at the wall opposite, the girl was Watching. When the child and her mother splashed water on the walls and scratched and peeled and tore and laughed, the girl was Watching. When the pair started working their way around the room in opposite directions, coming towards the girl from either side, the girl was Watching. When the child looked straight at her, and rubbed a sponge across her face, clearing the greyness just for a moment, the girl was Watching. When the first coats of paint went on, the girl was gone. This is the ninth attempt in a writing challenge I have set myself. Bloody hell, it’s cold in here. So many lies, some big, some small, and the one that bothers me most of all is how they promised we would be comfortable but instead it’s anything but. Once there was a girl. She lived in a cold, hard, dark place. I thought maybe if I started writing it down, it might feel a little less lonely in here. I mean, there’s 74 of us, including the kids, and that should be busy enough for anyone. We filled a coach, you know? And there’s all different ages and stuff. But it’s like when you’re a kid and people expect you to just get on with other kids because you’re all, well, kids. I think a couple of people were neighbours, and everyone looks vaguely familar; all from the same area, of course. But it’s not like anyone here was actually friends. You can’t take 74 people, shove them in a place like this and expect them to just… get along. Once there was a girl. She lived in a cold, hard, dark place. It was meant to keep her safe. It was meant to keep her family safe. At least I have my family with me. There was one woman, Hayley… her husband was away travelling and her kids had been sent to her in-laws for a week to get them out of the way of the chaos. We’ve been here a week and she hasn’t stopped crying. They burnt all the kids’ toys, but she managed to sneak something in with her – God knows how, with all the showers and suits and all the rest of it. It’s this tiny little plastic thing – like a toy you get in a chocolate egg? I know some of the others are pissed at her and regard it as, like, a threat. So they avoid her. I wouldn’t mind sitting with her. At least she doesn’t try to talk to anyone. But dad would kill me. He’s one of the ones who’s scared of her. The girl was grateful that she got to keep her dad and her little brother with her. She saw people around her who had lost everything. And she wondered if they really wanted to be safe anyway. That’s the thing about being saved. No-one ever asks you if you really want it to happen. Hayley had to be sedated when she realised they weren’t going to be picking anyone up and bringing them to us. The best they could offer was that the evacuation programme was going on everywhere, so if they were deemed low enough risk to be assigned to a camp, her kids and husband might, separately, survive. They’d be undergoing screening at the same time. Screening. It sounds pretty reasonable, doesn’t it? And you know what? It’s not even a bad procedure. It’s not humiliating. They make it kind of comfortable. If you could see the nurses’ faces you’d reckon they were being kind. Just a drop. Pink card. If it stays pink, you get on the bus. If it goes blue, you’re on your own. They say if it goes black there is no bus, and the whole thing shuts down there and then. Only how does anyone know this? We were told about pink and blue. They were honest about that. But if it’s all just happening know, where did the black story come from? She had been so relieved when the paper had stayed pink. And then she had been terrified, because she’d gone in first and her brother was right behind her so that he’d feel confident and safe because even though he wasn’t really a little little brother he was still her little brother and he needed her. But then they let her stay to see. And he was fine. And then their father made them leave the room for his test and they sat, cold hand in cold hand, in the bus waiting room for the two minutes that felt like days. It’s funny. It’s maybe the first time I’ve been grateful that my mother isn’t around anymore. She was spared all this. They had been in the cold, hard, dark place for only a week, but already there was a routine. Everyone ate together, four times a day. They didn’t really have any tasks to do other than prepare food and clean up afterwards and it was warmest in the ‘kitchen’ where the fire was. They’d been given enough food and fuel to last months and promised more was coming, so they weren’t saving much. Though now, as the truth dawned about how little they’d been told and how much had turned out to be accurate only on a technicality, they did wonder if they should start rationing. Because what if those supplies never came? What’s the phrase when something is missing and it’s really obvious? Conspicuous by its absence? That would be the best description of our medical supplies. We have enough to deal with a grazed knee and that’s it. We each got The Shot (I don’t know why, but whenever anyone talks about it it’s like it has capital letters and that’s just how I think of it now), and then that was it. They never did answer the question of what happened if The Shot didn’t work. Just some waffle about how it wouldn’t be an issue, because it always worked. Kit, this girl of, oh, I dunno, I think she’s about 9? Anyway, she asked how come they got to wear the suits and round up the people and how we could qualify for that (she actually used the word qualify, immensely smart kid, I like her but she kinda scares me). That didn’t even get waffle. Just totally ignored. Among those still-plentiful supplies, though, the girl was surprised to find they had been given paper and pencils. She decided to write down her story, as much as she could, in case that food ever did run out. Because someone should be able to know what happened here. If only the girl was ever able to figure it out. This is the eighth attempt in a writing challenge I have set myself. This is the seventh attempt in a writing challenge I have set myself. Once there was a Girl who was afraid. She was afraid of the unfamiliar, and of the dully commonplace. She was afraid of the dark, and of the bright lights. She was afraid of hardness, and of too much comfort. And so, almost everything frightened her. Looking ahead was full of the dangers of the unexpected. Looking to each side offered nothing new. Looking behind revealed a series of gaps and potholes, pitfalls and valleys so deep she forgot that they had steep walls that led upwards as well as down. So she carried on, and in a strange way the Fear became her friend; it was familiar yet exciting, it was expected yet unpredictable. She carried it with her always, sometimes a shivering mouse in her pocket, sometimes a writhing snake around her ankles, sometimes a fierce eagle digging its talons into her shoulder. Some days, she could make the Fear do her bidding. It would stride beside her, a gundog with its eyes trained to the distance. Some days, it would dash ahead, an ill-mannered mutt dragging her behind. Most days it trotted to and fro, picking a meandering path, occasionally needing a tug to keep up and occasionally startling her as it jumped up against her. Some people told her she must cast her Fear away, banish it for good. These words only made it cling to her tighter, shortening her breath. Some people told her to let her Fear guide her, to constantly follow in its wake. These words made her feel like a compass was slipping from her hand to crack uselessly against the ground. Finally, in confusion, the Girl made a decision that also scared her. She decided to talk to her fear. To ask it what it wanted of her, and what she should do. She was afraid that it might tell her it wanted to leave, and that it would abandon her. She was afraid that it might tell her it had to stay, and that she would never breathe freely again. But she knew that if she never asked, she would never know, and that uncertainty was the heaviest weight to carry. So she asked the Fear what she must do. The Fear asked her if she really wanted to know. Saying it a second time scared her even more, but she repeated her request – closing her eyes and holding out her hand, in which there was a leash. The Fear waited for a long moment, until it seemed like the Girl might give up and walk away. And then, when she was almost at the end of her strength, it spoke. The Fear told her to push and pull. To lead and follow. To test the leash and taste the air. To allow and to deny. To whisper and to shout. To fear the terrifying and the mundane. To interrogate the unknown and question the obvious. The Girl listened to all the Fear had to say, slowly turning the leash in her hands. She had meant to either offer it to the Fear, or tie it securely to her belt. But as the Fear stopped speaking, and turned to her expectantly, she found that neither one of these two actions was appealing. The Girl looked at the Fear for a long time, and it looked straight back at her. Its eyes glowed with warmth, and with an unsettling hollowness. You are my Fear, said the Girl. And I will not set you free. And you are my Girl, said the Fear. And I will not let you go. And so the Girl and the Fear walked on. Sometimes the Girl marched ahead, the leash slack in her hand, and the Fear dawdled behind. Sometimes the Fear charged ahead, the leash straining, and the Girl skipped hesitantly in its wake. But the Girl never let go of the leash. And the Fear never pulled it out of her hand. This is the fifth attempt in a writing challenge I have set myself.